My wife has been going to the dentist a lot this year. The reason? She has a bunch of faulty fillings from years ago that have gone bad and required a lot of work to fix. While we have dental insurance, it only covers a percentage of any work done (other than cleanings) so we have had to pay a pretty penny out of pocket for the work. Really it’s being paid for a second time, as my wife already paid for this work years ago at one of those dental clinics that are a lot cheaper than a regular dentist. In her effort to save money that she didn’t have, she paid a really bad clinic to do really bad dental work. Turns out it doesn’t save much in the long run if you have to pay even more later to fix what they did! There are several reasons why visiting a dental clinic like the one she used to go to will cost you more in the long run. Let’s take a look at a few of them. Those clinics are in the business of doing dental work like an assembly line operates. Quick in, quick out, get the next guy in there asap. They have to keep a constant stream of patients to keep their costs down and keep those interested in saving money coming back for more. Because they have to work so fast, they don’t let your mouth get as numb as it needs to be. Then, when they start working on you, it hurts – so maybe they don’t scrape out every last piece of corrosion. They then give you the filling but there is still decay under it, which continues to grow and needs to be fixed later. Clinics use less expensive tools, machines, and materials to save money. Because they don’t normally get reimbursed by insurance companies, they take the cheap way out when buying the good they need to do their job. This in turn could make for ineffective fixes in your mouth, which just get worse with time. Sometimes the staff is not as trained as they should be. I want to know that my dentist or hygenist is the best I can find, and while I am sure that some who work at those clinics are properly trained I bet most of them are not. Otherwise, wouldn’t they be working at a dental office with proper pay, equipment, and support? Of course, there are exceptions to any rule, and the same applies for dental clinics. I am sure there are some that are perfectly fine, but the one my wife went to back in the day obviously was not. They are a “chain” dental clinic, found in lower-income neighborhoods across America. 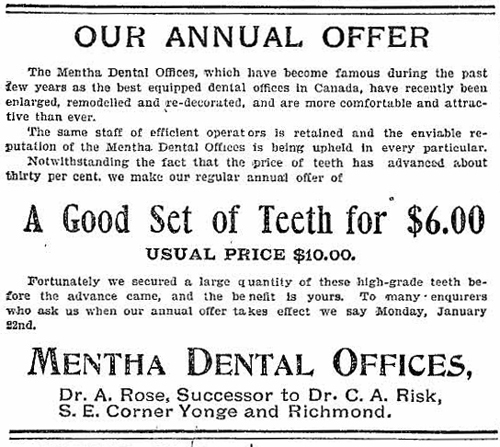 My wife was not making a lot of money back then and she needed dental work – so she went to who was the cheapest she could find. Unfortunately, the cheapest she could find was also the worst, which has led her back to many hours in the dentists’ chair getting the previous work scraped out and repaired. Which leads me to this – just because it saves you money today doesn’t mean it is going to save you money in the long run. Your health is important enough to spend money on, even if you have to go on a payment plan with the dentist for the next few years. I spent over $10,000 last year on my own health issue, and I would do it again in a heartbeat. Cause really, what’s the alternative? Warehouse Store Versus Regular Grocery Store – Do You Really Save Money? Inheriting 80 Year Old Tools – That Still Work Fine. Getting The Lowest Subscription Cost On The Newspaper. I couldn’t agree more with this! And I don’t even like going to the dentist! 😉 I went to a “dental factory” years ago, when I was first out on my own and didn’t know any better. It was SO much cheaper to use the insurance option to go there, that I probably should have known better. But, I was pretty young and had no idea what things cost anyway, heh. My wisdom teeth surgery actually went very well there, but not much else. Now I have bridgework (that may have been avoided elsewhere) that I am very unhappy with and it’s been 11 years! People use the same reasoning when shopping. They pass up a better unit price on a larger quantity (which saves money in the long run), to purchase a smaller quantity which may cost less (which saves money in the short run), but have a higher unit price. Then, when the item is used up, they repeat the behavior, paying the higher unit price again. This could have been avoided had they bought the larger quantity in the first place.